Nike Golf has a new line of women’s clubs, the Verdana, that is the lightest ever produced by Nike through the use of lightweight materials and construction to foster faster swing speeds. 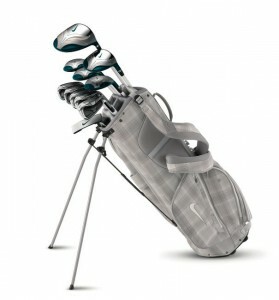 A Verdana set is comprised of driver, 3-wood, 4, 5 & 6 hybrids, 7-PW irons plus sand wedge, putter and a matching carry bag. The Nike Verdana driver is ultra-lightweight with a 460cc head and additional loft for higher trajectory while the 3-wood (18°) has a low center of gravity in a large breadth profile head. The hybrids feature wide soles and deeper iron-like faces with a slight offset for added forgiveness from a variety of angles and lies. Irons and wedges include a wide sole design, large faces and variable face thickness while the Verdana putter is a classic-shaped heel-toe weighted blade. The Nike Verdana set is available in standard and petite (minus 1”) lengths with a street price of $900.